Robert Franklin Williams (February 26, 1925 – October 15, 1996) was an American civil rights leader and author, best known for serving as president of the Monroe, North Carolina chapter of the NAACP in the 1950s and early 1960s. At a time when racial tension was high and official abuses were rampant, Williams was a key figure in promoting armed black self-defense in the United States. He succeeded in integrating the local public library and swimming pool in Monroe. He helped gain gubernatorial pardons for two African-American boys convicted for molestation in the controversial Kissing Case of 1958. He obtained a charter from the National Rifle Association and set up a rifle club, which became active defending blacks from Ku Klux Klan nightriders. He used the NAACP to support Freedom Riders who came to Monroe in the summer of 1961. That year he and his wife were forced to leave the United States to avoid prosecution for kidnapping, on charges trumped up during violence related to white opposition to the Freedom Ride. The kidnapping charges came after a white couple sought shelter in Williams' home when they were confronted by black protesters while driving through Monroe's black community. A self-professed Black Nationalist, Williams lived in both Cuba and The People's Republic of China during his exile between 1961-69. Williams was born in Monroe, North Carolina, in 1925 to Emma Carter and John L. Williams, a railroad boiler washer. His grandmother, a former slave, gave Williams the rifle with which his grandfather, a Republican campaigner and publisher of the newspaper The People's Voice, had defended himself in the hard years after Reconstruction in North Carolina. At the age of 11, Williams witnessed the beating and dragging of a black woman by a police officer, Jesse Helms, Sr. (Later chief of police, he was the father of future US Senator Jesse Helms.) As a young man, Williams joined the Great Migration, traveling north for work during World War II. He witnessed race riots in Detroit in 1943, prompted by labor competition between European Americans and African Americans. Drafted in 1944, he served for a year and a half in the segregated Marines before returning home to Monroe. In 1947, Williams married Mabel Robinson, a fellow civil rights activist. They had two children. First they worked to integrate the public library. After that success, in 1957 Williams also led efforts to integrate the public swimming pools. He had followers form picket lines around the pool. The NAACP members organized peaceful demonstrations, but some drew gunfire. No one was arrested or punished, although law enforcement officers were present. Monroe had a large Ku Klux Klan chapter at the end of the 1950s, estimated by the press to have 7,500 members, when the city had 12,000 residents. Alarmed at the violence that civil rights activities aroused, Williams had applied to the National Rifle Association for a charter for a local rifle club. He called the Monroe Chapter of the NRA the Black Armed Guard, made up of about 50-60 men, some veterans like Williams. They were determined to defend the local black community from racist attacks. Newtown was the black residential area. In the summer of 1957 there were rumors that the KKK was going to attack the house of Dr. Albert Perry, a practicing physician and vice-president of the Monroe NAACP. Williams and his men of the Armed Guard went to Perry's house to defend it, fortifying it with sandbags. When numerous KKK members appeared and shot from their cars, Williams and his followers returned the fire, driving them away. "[R]acist consider themselves superior beings and are not willing to exchange their superior lives for our inferior ones. They are most vicious and violent when they can practice violence with impunity." He wrote, "It has always been an accepted right of Americans, as the history of our Western states proves, that where the law is unable, or unwilling, to enforce order, the citizens can, and must act in self-defense against lawless violence." On 12 May 1958, the Raleigh Eagle (a North Carolina newspaper) reported that Nationwide Insurance Company was canceling Williams' collision and comprehensive coverage, effective that day. They first canceled all of his automobile insurance, but decided to reinstate his liability and medical payments coverage, enough for Williams to retain his car license. The company said that Williams' affiliation with the NAACP was not a factor; they noted "that rocks had been thrown at his car and home several times by people driving by his home at night. These incidents just forced us to get off the comprehensive and collision portions of his policy." The newspaper article reported that Williams had said that six months before, a 50-car Ku Klux Klan caravan had swapped gunfire with a group of blacks outside the home of Dr. A.E. Perry, vice president of the local NAACP chapter. The article quotes police chief A. A. Maurey as denying part of that story. He said, "I know there was no shooting." He said that he had had several police cars accompanying the KKK caravan to watch for possible law violations. The article quoted Williams: "These things have happened," Williams insisted. "Police try to make it appear that I have been exaggerating and trying to stir up trouble. If police tell me I am in no danger and that they can't confirm these events, why then has my insurance been cancelled?" Williams initially told them that they were free to go, but he soon realized that the crowd would not grant safe passage. He kept the white couple in a house nearby until they were able to safely leave the neighborhood. North Carolina law enforcement admonished Williams and accused him of having kidnapped the couple. He and his family fled the state with local law enforcement in pursuit. His eventual interstate flight triggered prosecution by the FBI. 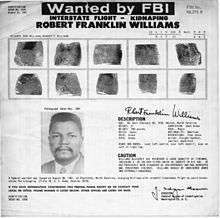 On August 28, 1961, the FBI issued a warrant in Charlotte, North Carolina, charging Williams with unlawful interstate flight to avoid prosecution for kidnapping. The FBI document lists Williams as a "freelance writer and janitor .. [Williams] ... has previously been diagnosed as a schizophrenic and has advocated and threatened violence... considered armed and extremely dangerous." After a Wanted poster, signed by the director J. Edgar Hoover, was distributed announcing he was wanted, Williams decided to leave the country. Williams went to Cuba in 1961 by way of Canada and then Mexico. He regularly broadcast addresses to Southern blacks on "Radio Free Dixie". He established the station with assistance from Cuban President Fidel Castro and operated from 1962-65. During this stay, Mabel and Robert Williams published a newspaper, The Crusader. He wrote his book, Negroes With Guns, while in Cuba. It had a significant influence on Huey P. Newton, founder of the Black Panthers. 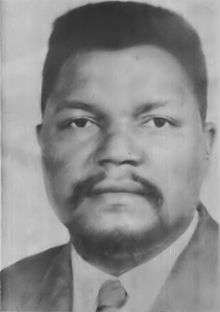 Despite his absence from the United States, in 1964 Williams was elected president of the US-based Revolutionary Action Movement (RAM). In 1965 Williams traveled to Hanoi, then the capital of North Vietnam. In a public speech, he advocated armed violence against the United States during the Vietnam War, congratulated China on obtaining its own nuclear weapons (which Williams referred to as "The Freedom Bomb"), and showed his solidarity to the North Vietnamese against the United States military onslaught of the country. In 1965, Williams and his wife left Cuba to settle in China, where he was well received. They lived comfortably there and he associated with higher functionaries of the Chinese government. In January 1968, Conrad Lynn wrote to encourage Williams to return to the U.S. He died from Hodgkin's lymphoma on October 15, 1996. He had been living in Baldwin, Michigan. At his funeral, Rosa Parks, who started the bus boycott in Montgomery, Alabama in 1955, recounted the high regard for Williams by those who marched peacefully with King in Alabama. ↑ Timothy B. Tyson, “Robert Franklin Williams: A Warrior For Freedom, 1925-1996” Archived July 8, 2013, at the Wayback Machine. Investigating U.S. History (City University of New York); accessed October 3, 2016. 1 2 Timothy B. Tyson, "Robert F. Williams: "Black Power" and the Roots of the African American Freedom Struggle", The Human Tradition in the Civil Rights Movement, edited by Susan M. Glisson, Rowman & Littlefield, 2006, pp. 227-54; accessed May 12, 2011. ↑ "In Memory of Robert F Williams: A Voice for Armed Self-Defense and Black Liberation", Revolutionary Worker, November 17, 1996. 1 2 Williams, Robert F. "1957: Swimming Pool Showdown", Southern Exposure, c. Summer 1980; the article appeared in a special issue devoted to the Ku Klux Klan, accessed November 17, 2013. 1 2 Mary E. King, Book Review: Timothy Tyson, Radio Free Dixie: Robert F. Williams and the Roots of Black Power; originally published on pp. 1127-28, Journal of American History, December 2000, posted at her blog Freedom Song, accessed November 17, 2013. 1 2 3 Insurance cancelled, Raleigh Eagle, May 12, 1958, p. 15. ↑ "Exile Robert Williams' Wife Returns to US from Africa", The Afro American (Baltimore, Maryland), August 30 or September 6, 1969 (unclear). ↑ Williams, Robert F., "Speech Delivered at the International Conference for Solidarity with the People of Vietnam Against U.S. Imperialist Aggression for the Defense of Peace. Hanoi, Democratic Republic of Vietnam November 25–29, 1965" (March 1965). The Crusader 6(3), pp. 1-5. ↑ "In Memory of Robert F. Williams:A Voice for Armed Self-Defense and Black Liberation– Forum". Assatashakur.org. Retrieved 2010-08-27. ↑ "Independent Lens . NEGROES WITH GUNS: Rob Williams and Black Power". PBS. Retrieved 2010-08-27. ↑ "Press and Photos – Negroes With Guns – Rob Williams and Black Power". Jou.ufl.edu. Retrieved 2010-08-27.